Last week I made some backgrounds with Brusho Colour Crystals and embossing folders and shared the first card I made which used the Woodland embossing folder. 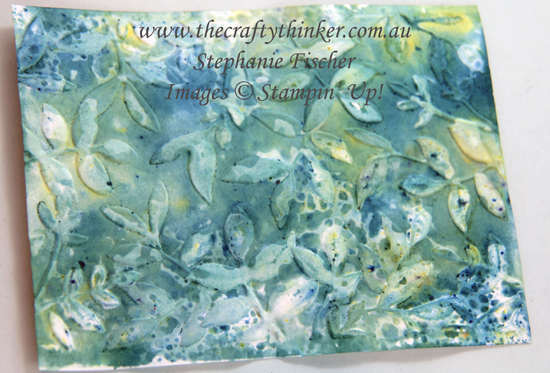 This time I've made a card with one of the Layered Leaves backgrounds together with the Petal Palette stamp set and coordinating Petals & More Thinlit dies. Sometimes the back of the watercolour background is more pleasing that the front! I really didn't like the "front" of this background - it came out rather dark and very speckled - so I turned it over and used the back! The base card is Mint Macaron, to which I added a layer of Blueberry Bushel. The foliage is cut from both Blueberry Bushel and Tranquil Tide cardstock and I offset them a little when I adhered them to the card front. 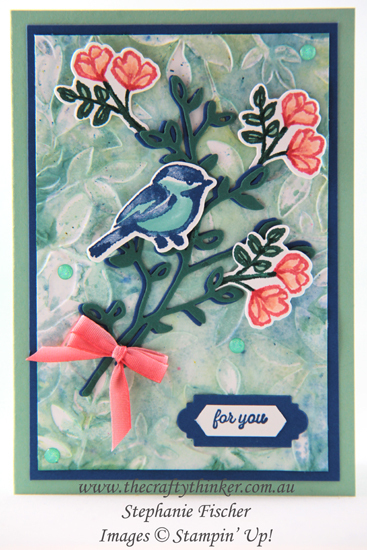 I stamped the bird with Blueberry Bushel ink and then coloured it with a Pool Party Stampin' Write Marker before cutting it out with the coordinating die and adding to the card with dimensionals. 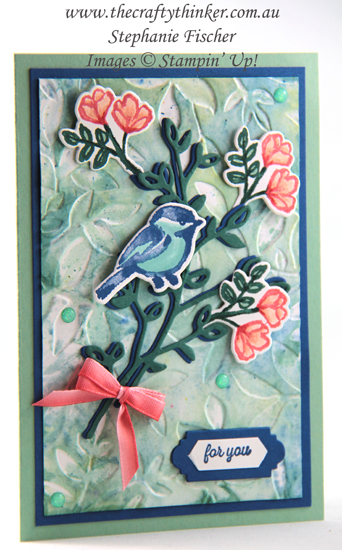 I used a Calypso Coral and Tranquil Tide Stampin' Write Marker to add ink to the floral stamp and then added some colour and shading with Mint Macaron and Petal Pink Stampin' Write Markers before cutting out with the coordinating die. TIP: When adding ink to stamps with markers, breathe heavily on the inked stamp before stamping - the moisture in your breath will reactivate any ink that may be drying out. To add the flowers to the card, I tucked the stems under the die-cut foliate with a little glue and popped the floral end up on Stampin' Dimensionals. The greeting from the Itty Bitty Greetings stamp set is stamped with Blueberry Bushel ink and cut out with the Classic Label Punch, shortened using this process. I then glued it to the Blueberry Bushel label that was shortened using this method. Finishing touches were the bow of Calypso Coral Ombre ribbon and some Glitter Enamel Dots.